Does Ari's Mom Have A Secret Recipe? Endeavor Agency’s Ari Emanuel talks several times a day to his brother, U.S. Rep. Rahm Emanuel, who is masterminding the Democratic Congressional Campaign Committee’s midterm elections. There’s a well-reported piece on Rahm in today’s Washington Post (Fighting For The Spoils) that mentions Ari. “They all play to win, those Emanuel boys. Rahm (left) is the middle son of three. His big brother, Ezekiel, is a Harvard oncologist and bioethicist. Younger brother Ari (below) is a high-flying agent in Los Angeles. He made news recently as the only major agent to publicly call for an industrywide shunning of Mel Gibson following the actor’s drunken, anti-Semitic tirade. Their baby sister, Shoshana, is a student. Yes, the folks are mighty proud, Rahm says. How many mothers have two children who have partly inspired TV characters (Josh Lyman on The West Wing for Rahm, Ari Gold on Entourage for Ari)? 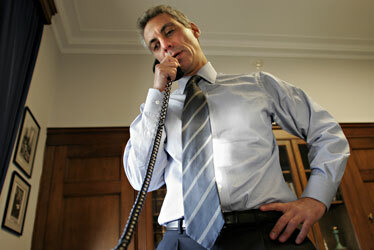 ‘People ask me what my mother put in the soup,’ says Ari, who talks with Rahm two or three times a day. ‘I wish I knew. I have three boys of my own.’ Their father is a Jerusalem-born pediatrician who came to the United States after working for the pre-independence Israeli underground. In Chicago, he met Emanuel’s mother, an X-ray technician and daughter of a local union organizer who ended up in more than one paddy wagon as a protester in the 1960s. ‘Politics and the civil rights movement were very much a part of our family life,” says Ezekiel. “We went on Martin Luther King’s march on Cicero with my mom. '” After November 7th, Rahm will move to Hollywood and help mastermind the “freeing” of clients from Endeavor’s rival agencies. Just kidding.